Bicycle touring and travel is making a comeback. Previously reaching a peak in the late 70s and early 80s, before giving way to bicycle racing, Millennials who have discovered cycling in an urban setting are starting to venture further and further out. 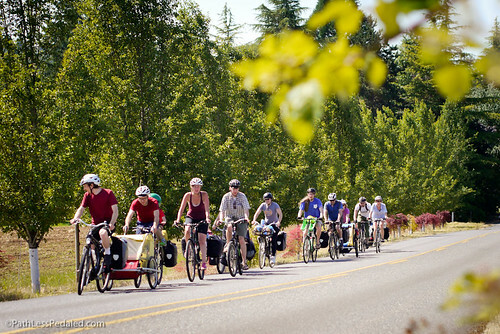 But this iteration of bicycle touring is looking different than the last. Bicycle touring was once only seen as the hobby of the wild-eyed and crazy extreme sports adventurer. A “real tour” had to be an epic undertaking across continents, through deserts, and slashing your way through a snake-infested swamp. While there are plenty of pedalers pushing boundaries, there has also been a growth in the popularity of short-form touring. S24Os and Bike Overnights are becoming more common cycling parlance. This is good for several reasons: It makes bike travel more accessible and broadens the touring market. It also allows people to enjoy the fun and sense of adventure of bicycle travel NOW without having to save up for years for that one grand trip. Along with the sea change of what is considered a “real” tour is the idea that you have to pedal every mile, no matter how terribly excruciatingly awful it is, because it’s cheating otherwise. The concept of a “rideshed”, the distance you can cover with your bicycle and transit (trains, regional buses, light rail) is starting to get traction. This makes perfect sense for people who live in large metro areas surrounded with Suburban Donuts of Death. You could ride out of a downtown, risk your life in the suburbs, and then enjoy quiet riding, or you could just cut to the good stuff using transit. We’ve long been proponents of combining Amtrak with bicycle travel because of their reasonable bicycle carry-on rates and the simple fact that the train moves at a more harmonious human speed. There is nothing like looking out the window for hours on a long train ride to wake up your inner traveler. In conjunction with shorter trips and the ability to use transit or other means to get out of dodgy riding areas, there also seems to be a growing interest in family bicycle camping. Family camping, once strictly the domain of minivans and Coleman tents, is also becoming more popular because of cargo bikes. Xtracycles, Yubas, Bakfeits and even trailers are making bike travel more accessible to families. In Portland, we recently participated in a family bike camping trip put on by Kidical Mass, which had a total of 22 bikes and 16 kids of varying age! The beauty of a bike-powered family vacation is you don’t have to travel very far or fast to make it feel like an adventure. With more people touring more often, tourist destinations and businesses are starting to take note. It’s simple math really. A traveling cyclist will eat more and will require more accommodations more often because of their limited travel distance. If your county is 200 miles wide, it will take a cyclist 3-4 days to navigate through it. As a tourist destination, you have a captive audience and it takes very little to attract and entice cyclists to stay. Oregon’s various tourism groups and DMOs are leading the way on this front. We’ve had the opportunity to work with them on their Scenic Bikeways and are amazed at how enthusiastic many small towns are at the idea of cyclists pedaling through. On the other end of the bicycle travel continuum is the new trend of off-road/gravel road/mixed-terrain bikepacking. Combining ultralight backpacking principles with frame bags and mountain bikes or fat bikes, touring cyclists are exploring new unpaved territory. In some ways, I think this is a response to the amount of traffic we experience day to day. A lot of the great road touring routes in the 70s aren’t so great anymore, so the current generation is looking elsewhere – namely, off road. This is also augmented by the fact that camping and bicycle technology have never been better! Gear is ultralight, bikes have lower gearing and a wide range of tires and suspension to tackle virtually any kind of terrain. Bike travel and touring are making a comeback in a big way. 6 or 7 years ago when we got interested in bike touring, it was a virtual wasteland. We’d walk into bike shops and ask about touring and the people behind the counter would just scratch their heads. Times are changing. Surly’s LHT has brought touring to the masses. The veritable explosion of young custom bicycle pannier/frame bag/rando bag makers is making bicycle touring hip and fun again. It’s never been better to travel by bike! That Big Dummy with two kid seats is awesome. Adria, I believe it’s a Surly Big Dummy. For folks looking to tour with kids, I highly recommend looking at tandems and triplets (or even longer bikes). They allow the child to pedal (and tire themselves out a bit) and they feel like a part of the team instead of just a passenger. We road across the country with our six year old a few years back and it’s a great way to see the country. 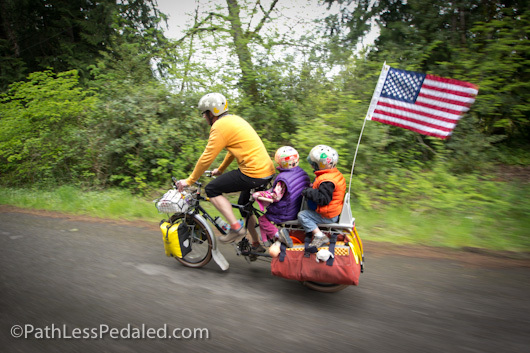 For some great pics of touring / riding families check out Mark’s photos from Precision Tandem’s website. so cool, wish i had started riding much earlier. riding with my kids. however have rode with grand kids til they get their cars. with autoimmune and celiac disease, special diet for food is required with most restaurant meals out. also with spinal stenosis, topped with being so close to that 80 year mark, the recumbent trikes are what i like the best. being in more control, travelling in a straight line without wobbling when going slow, being able to stop on a hill, sit there on the trike while resting and then starting up from there with no wobble, is reassuring to us old timers. looking forward to riding with my great grand children. oldest is 6 now. because of my age and that i can’t leave wife alone much, most of my rides are shorter now, much shorter. i still have a small bike trailer yet and a car trailer which i can pull with my sun EZ-3 USX USS since i installed the granny gear and mud and snow tire on the drive wheel. sold my garden wagon, 2′ x 4′ that i hauled topsoil and concrete blocks, wood, garage sale furniture on. sold another two wheel trailer i had, and gave away my one wheel homemade trailer. Can you tell more about the garden trailer? That sounds very much like something I could use. Great to see that towns and other destinations are waking up to the fact that cyclists are valuable tourists! I don’t always find Amtrak to be that accommodating of my bicycle. I want to take it to chicago but it is a real hassel. Once in Chicago the metra train is very accommodating of commuting bikes. In North Texas there is a off-road trail that is under development. There are spots where opposition is delaying progress. I cannot understand how a small community with little to no economic development would turn their back on ANYTHING as easy as this to bring in money to their community. With an area the size of Dallas/Fort Worth at the trailhead, there are TONS of families that could be doing these S24O or even long weekend family tours if the trail were passable from start to finish (without need for unnecessary detours around some hold-out town). Maybe as they see their neighboring towns reap the benefits they will change their minds. I am also a proponent of Amtrak/bike travel. It’s a great way to see new parts of the country w/ out the expense, pollution, fossil fuels & hassle of a car. Another slowly but surely growing bike travel trend is long-distance trails. People are discovering the beauty, history and serenity of avoiding the road & hitting the trail. It is much safer & more scenic than road biking and much, much more relaxing. And it’s not just for mountain bikers or campers. 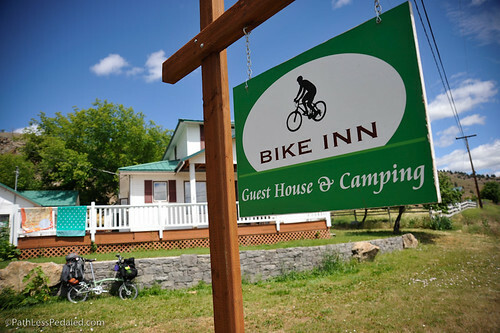 Many of the major routes are paved, cement or smooth gravel with convenient lodging & dining along the way. And best of all, there are trails for everyone including urban, rural & downright remote paths. Did I mention that you meet the nicest group of international travelers on these trails, too? We have been enjoying our overnight and over-two-night trips. A great way to escape from the grind and see some country we would never see otherwise. And it doesn’t take a huge amount of planning nor does it require a lifestyle change. ….And a United States flag blowing in the breeze, wind-resistance be damned! By the way, who you calling a Big Dummy?! 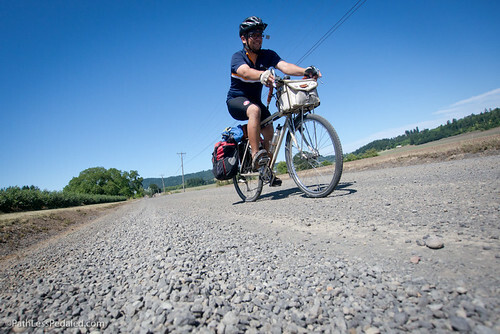 Great blog post, although I don’t think gravel touring is new at all, especially in the west. It’s just gotten more popular lately. A lot of states have wonderful backroads that just beg to be ridden by bike. I look forward to more stories about it on your blog. 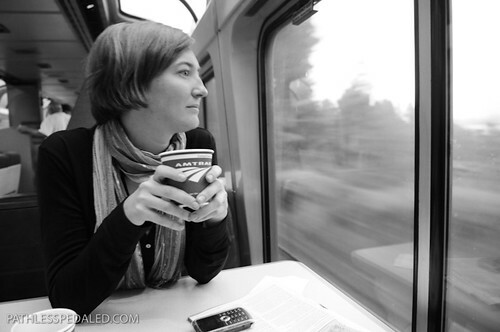 I did my first Amtrak multimodal tour this year and plan on several more in the years to come. Now that I’m carfree, I see a lot of S240 trips waiting out there, too. Ride on! I agree with your first four very much… while number five might be somewhat of a stretch. If I had written this list I would have put TECHNOLOGY in number 5’s spot. The modern bicycle traveler is using a GPS instead of a paper map. He has a smartphone to access the Internet and easily solve problems on the road, talk.with friends and family back home, or read books/play games/listen to music etc. And, of course, sharing our travels by bike has never been easier. Blogs, social media, email and more. And all of this has come about in just the last 15 years or so. I think that is pretty major when you compare it to the 1970’s style of bike touring that is so well known in America.